This page is for people to put in a request for information or help – please send your request to the Research Lead via our Contact Us page. Note the Cross is now on the opposite side of the road. To supplement Jeremy Lodge’s research on Collingham’s Anglican Churches he has been looking at non-conformism in the village. 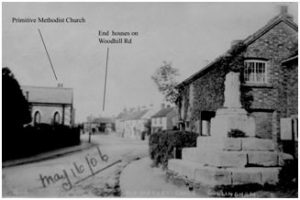 Do you have any information on the Collingham Primitive Methodist Church which was also known as the ‘The Jellico Hall’, or the former Plymouth Brethren Chapel at the junction of The Scutchell and Low Street? Please contact Jeremy (Journal Editor) either by sending a message via our Contact Us page, or through the Jubilee Room.